It’s a grey, rainy Monday morning here. Summer is fading fast – the cherry tree in the front yard, always the first to drop her leaves, has been bare for a few weeks and the dogwoods are quickly changing color. It seems as a good as any to catch up on posting pretty summer flower pictures. And cool bugs of course. 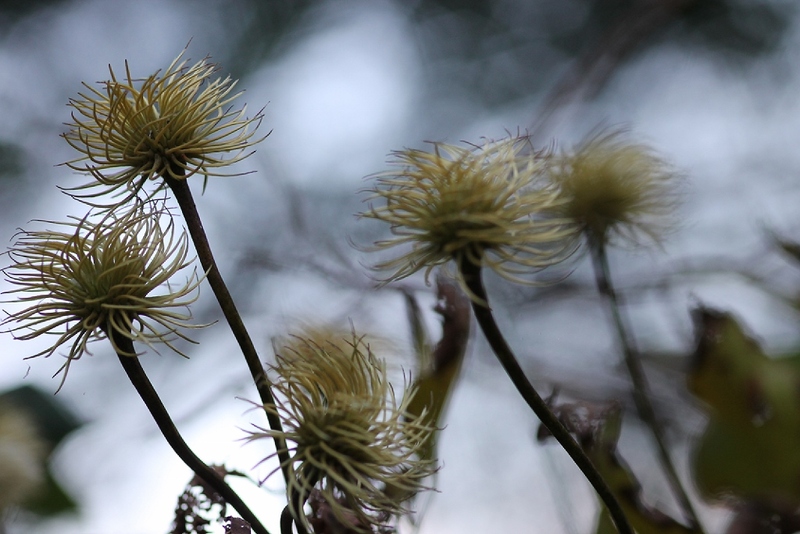 Clematis are very Seussian once their blooms fade, aren’t they? The nearby mountains are still fairly green, but I know that is about to quickly change. Local apple season is full swing – I snapped those shots of the Blue Ridge on my way out to my favorite apple orchard the other day. I spent time this weekend getting some fall greens in the ground, the sort that hold up well in frost – kale, mustard greens and the like. The canning shelves in the basement got organized too, with notes made of what I need to jar before the growing season ends. Mostly green bean and watermelon rind pickles. Definitely not tomatoes, we are more than good on tomatoes, which leaves me some room to play with the half box left over from the weekend’s canning class. With plenty of diced tomatoes, pizza sauce and tomato jam on hand, I’m thinking marinara might be the way to go, with as many tomato sandwich dinner variations as I can possibly pull off between now and the fast approaching end of tomato season. Variations on Hot Pepper Sauces.